It’s a universal truth that food tastes better when it’s been deep fried. There are other options if you want to try healthy frying, but most would agree that deep fat frying is the best for taste. Ask anyone, especially in the UK, and at least one person will say ‘they know they shouldn’t, but…’ For the home chef, however, trying to replicate this in your own kitchen can be tricky. Oil temperature needs to be just right to avoid greasiness or burnt food. Oil sizzling in a pan tends to jump out at you and your worktop; both messy and a pain to clean. 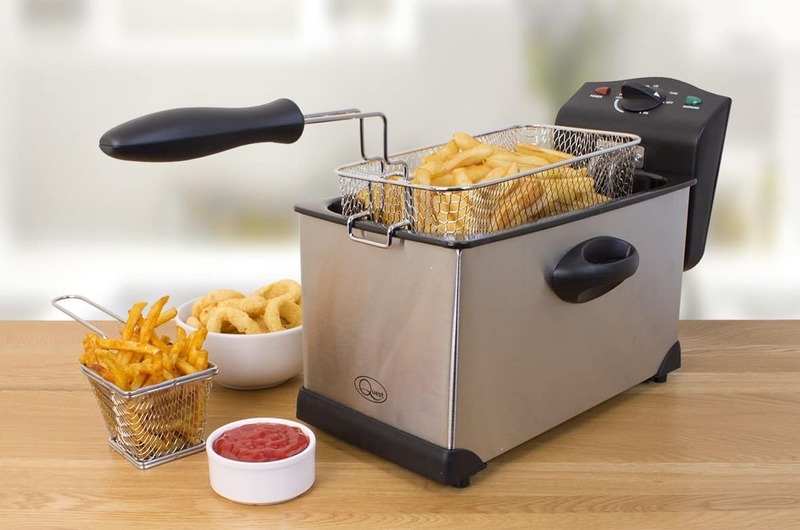 Indulging in this love affair with fried food, therefore, becomes much simpler with your own deep fat fryer. You’re not limited to chips – fry whatever your heart desires in comfort and safety. Here’s our pick of the best home fryers. Which deep fryer should I go for? How much food can I cook? Boasting one of the larger oil capacities you’ll find in a home fryer, the nonetheless compact Quest Stainless-steel is a great all-round performer. Despite sitting on the cheap end of the spectrum, this deep fat fryer holds 3 litres of oil. This comfortably cooks enough for 2-3 people in one go. This unit also handles temperature very well. 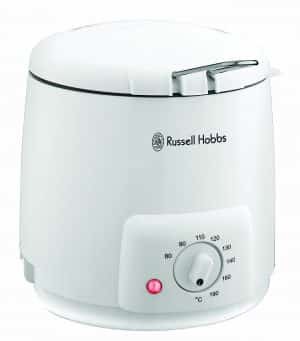 It gets up to temperature quickly and adjusting it is super simple thanks to the dial at the back of the fryer. An innovative ‘cool zone’ feature also helps the oil cool down rapidly after cooking. That way, anything that’s fallen out of the fryer basket won’t burn and contaminate the oil. In turn, this reduces the frequency of changing the oil. This compact option from Swan features a generous 2.5-litre capacity, with a well-proportioned basket able to hold food enough for 2. One of its best bits is the temperature control; fully adjustable to give you maximum control, but also offering 4 temperature presets and an automatic off-switch. So, you can rest assured your food will be cooked to perfection, without the risk of overheated oil. Safety is a big part of the Swan’s design. The oil container is fixed, meaning that the oil stays safely in the appliance, with the secure lid helping the minimal splash risk. Cool-touch handles and the fryer basket handle also allow you to keep your hands away from the business end of the hot oil. The whole unit is also very easy to clean. The inner pan has a non-stick coating, meaning that once empty, you can just wipe clean and start again with the cooking. This product prides itself on a big capacity with no fuss. Claiming a 3-litre oil capacity, which can cook up to a kilo of food, this appliance should capably cook for at least 2 people. It manages a relatively low weight and compact size despite the extra capacity, so can conveniently slot into whatever space you have. It also has multiple safety features; there’s an auto shut-off function in the event of overheating. The supplied lid keeps the hot oil covered, and the viewing window lets you watch the progress of your food as it cooks. Handling the unit is equally simple and safe thanks to the cool-touch side and basket handles. 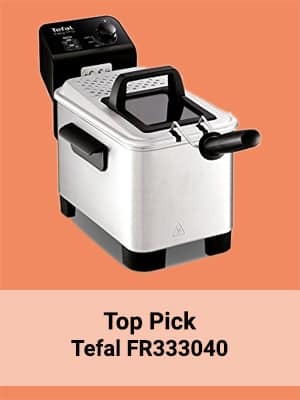 Coming with a simple temperature control dial and an easy-to-remove basket, this fryer will do everything you need, with high-quality frying at a reasonable price. 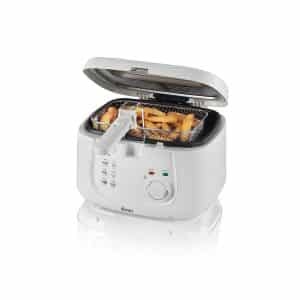 The mid-range Benross Fryer from Quest is a user-friendly, simple to use piece of kitchenware. The 2.5-litre oil capacity is more than enough for a couple of people but is nonetheless a great compact appliance. One neat feature is the lid, which not only uses a viewing window for you to keep a close eye on what’s cooking inside but can remain closed while you lift food out of the oil. With a safety lock and cool-touch on top of that, you’re all set to cook in comfort. The temperature dial is big, bold and easy to read, with useful temperature guides for different foods printed on the front. Another neat touch is the built-in odour filter, which cuts out that distinctive fry oil smell. 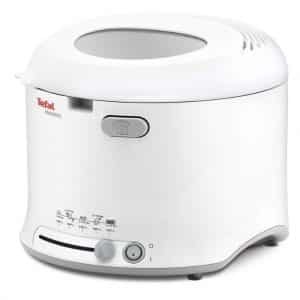 The MaxiFry is a great mid-range offering from Tefal, with a 1.8-litre oil capacity and enough room for 1 kilo of food. This should let you feed 2 people without breaking a sweat. You can keep a close watch on your food as it’s cooking thanks to the large viewing window in the lid and can easily handle a variety of different foods. The temperature is controlled via a simple slider on the front of the unit, which is printed with heat guides for various food types. The compact size and cool-touch handles/exterior let you move this around with ease. The inner basket’s handle is also adjustable, keeping it simple to store. Cleaning is super convenient too, with the basket and lid dishwasher safe. The 3-litre oil capacity of Aicok’s Deep Fat Fryer will ably cook enough food for the family. It uses its capacity cleverly, however, maintaining a fairly low profile that should slot neatly into any kitchen. Temperature is managed via the simple thermostat, with heat guides for a variety of foods. Another neat feature comes courtesy of the timer setting, also controlled via a straightforward dial. This, paired with temperature shut-off technology, means you can cook in safety. You can also monitor the cooking process via the viewing window in the lid. Among the most useful of the Aicok’s features is the ability to take the whole thing apart. All the main parts are removable for ease of cleaning, which therefore makes emptying the oil a simple process. The cooling function does also allow the oil to cool down quickly, prolonging its life. 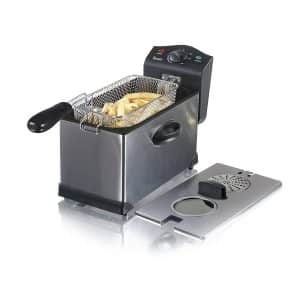 Breville’s offering in the world of home deep fat fryers offers great features and capacity at a reasonable price. The deep basket can hold up to 2 litres of oil and 1 kilo of food, comfortably enough to cook for 2 or more people. It excels thanks to a highly useful digital timer, with sound alarms when the time is up. Paired with the simple temperature control dial, and you’ve got a winning combination. The appliance’s best feature is as the name suggests; cleaning could not be simpler. The basket, lid and oil container are all removable, giving you a convenient cleaning solution. It also packs away nicely, with a built-in cord storage to keep the fryer stored with no fuss. This unit from Russell Hobbs may be mini, but don’t let its size fool you. 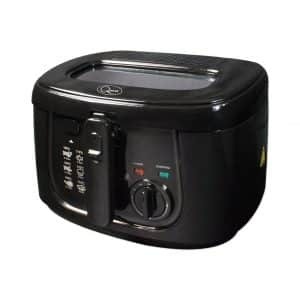 Packing the perfect amount of useful features into a small package, the Compact Fryer is ideal for one-person food servings with 0.9-litre oil and 350 g food capacities. Simple convenience is at the heart of this appliance; using it could not be easier. The thermostat dial is clean and bold, and the whole unit takes up minimal storage space. The fry basket is well made, and there’s an integrated metal filter for added practicality. The small size also lends itself to simplicity of cleaning – it’s easy to empty out the lower quantity of oil, and with a quick rinse the inside is ready to go again. 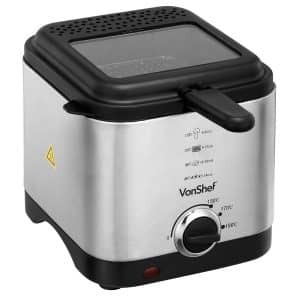 Versatility is a core feature of the VonShef Compact, with a generously proportioned interior allowing you the freedom to experiment with plenty of foods. It uses the 1.5-litre capacity well, balancing a convenient overall appliance size with enough space to cook for 2. It also boasts a huge viewing window to let you keep an eye on what’s frying with ease and safety. The thermostat dial allows for easy temperature control, with guides printed on the sturdy stainless-steel outer for easy reference. This exterior material gives the appliance a sturdy but lightweight build, while the interior also features a non-stick coating. Cleaning and food removal are therefore a breeze, especially thanks to the removable fry basket (and removable handle). As the name suggests, the Tefal Easy Pro brings professional frying standards in a home kitchen-sized package. Housing a 3-litre oil basket that can hold 1.2 kilos of food this is a family sized fryer with advanced technology that won’t leave you out of pocket. By using a heating element that is in direct contact with the oil, you are assured of rapid heating. However, having the element and oil in contact also creates a ‘cool zone’ under the element, which collects crumbs and leftovers from the frying process. Therefore, your oil stays cleaner for longer and limits the frying odours produced. Also featuring a simple thermostat, large viewing window and cool-touch handles, it’s designed with the user firmly in mind. The best feature, however, has to be the ease of cleaning – all parts are removable, and dishwasher safe to boot. Efficiently designed to get the most out of a compact design, the Mini Fryer from Tefal packs great features into a small package. It’s a 1-person unit, with space for 1 litre of oil and about 600g of food. It’s also a very user-friendly appliance on several levels. Temperature control is straightforward to manage via a dial, and you can check on the progress of your food as it’s cooking thanks to the large viewing window. The lid (which features a metal filter) and fry basket are also dishwasher safe for ease of cleaning, which is also backed up by the non-stick lining of the interior. Taking up very little physical room, it also proves a good economical choice with a low energy rating as well as the low oil capacity. Best on test – Tefal’s FR333040 Easy Pro is the winner on test here. With a set of features that are more advanced than in the other reviews here, but by no means the most expensive choice, it’s hard to go wrong. Stand-out bits include the more professional-standard heating element; by keeping in direct contact with the oil, it ensures a quicker heating time. The other benefit to this is the creation of a cooler zone underneath the element, so any remnants of food sink down without burning or contaminating the oil. Therefore, your oil lasts longer and your food cooks better. With a large capacity too – 3 litres of oil, enough to cook 1 kilo of food – the Easy Pro represents premium features, but not such a premium price tag. 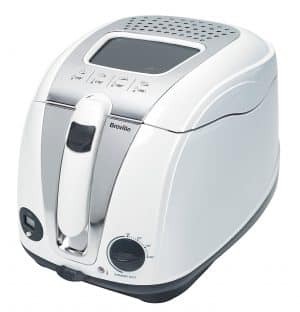 On a budget – The Russell Hobbs Compact Fryer stands above the others as the best budget option. It’s a no-nonsense piece of kit, that does the job without fuss. For its low price, you’re buying something with enough capacity to serve 1 comfortably, but of course, more if you’re prepared to cook multiple batches. It also proves to be the best budget option in terms of oil, which you shouldn’t overlook in terms of your fryer. Using less than 1 litre of oil, it’s very economical in both oil and purchasing cost. An ideal option on a budget, and therefore a great choice for students as well. 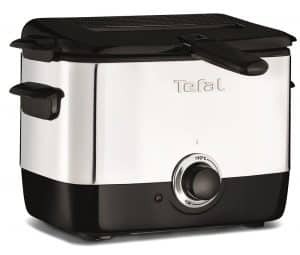 The best compact option – The Tefal FF22040 Mini Fryer is almost, but not quite, the smallest here by volume. But, it uses its compact volume very efficiently and represents the best for storage economy out of all the reviews. Using a functional shape combined with a very low weight, it will fit into even the smallest of kitchens without being obtrusive. Best for safety features – The Aicok Deep Fat Fryer edges out as holding the best safety features. 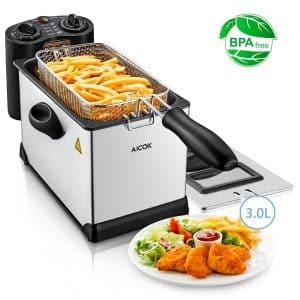 While using a deep fryer unit is generally safer than a frying pan full of hot oil, the Aicok has a number of thought-out components that mark this out as the best. Like several others, it has cool-touch handles for easy use while hot, but the most useful has to be the automatic shut-off system. It prevents the appliance from overheating and will turn the appliance off if there is no oil in the machine at all. The timer function also means there’s no chance of your food over-cooking and burning, although you can also easily monitor your food thanks to the viewing window. The ease of disassembly for emptying oil and cleaning helps its cause as well. Easiest to clean – The Tefal FR333040 Easy Pro is, out of all the reviews, the best choice when it comes to cleaning and maintenance. Oil can be a bit of a messy business, so a machine that facilitates easy cleaning is very helpful. All the parts; lid, fry basket, handle and oil container; are removable and dishwasher safe. You can, therefore, be sure that every time you cook, the machine, and therefore oil, are as clean as possible. There are a few things to consider when you’re investing in a deep fat fryer. Knowing how many portions of food you’re regularly cooking naturally plays a part, but there are other considerations to make around size, ease of use and general practicality. Our reviews will help you make the best decision around your needs, so read on for a guide to answer your purchasing questions. Capacity plays a big part in making the decision of which deep fat fryer is right for you. It’s vital that you buy one large enough for the number of people you’re cooking for. Get one too small, and you’re doing multiple batches. At the very least, this takes up valuable eating time! As long as you can be sure how many people you’re regularly cooking for, the rule of thumb here is that bigger = better. Most fryers range from, at the smaller end, holding a little under 1 litre of oil, to the biggest that hold around 3 litres. Anything around 1 litre or under is a 1-person fryer, and it tends to scale up accordingly there – at best, you’re going to get enough for 3 to 4 people out of a 3-litre unit. Keep those rough sizes in mind and you’ll have no trouble. Not all foods fry equally. Naturally, there is a good temperature that most foods fry well at, around the 190°C mark, but ensuring that you have good adjustability for the foods that need a different temperature is key. The more versatile machines will have greater levels of adjustability, and some even come with preset temperature guides for certain (more tricky) foods. The golden combination is mixing variable temperatures with a timer setting, which help keep food in that ‘just right’ heat range for the ideal time. Put simply, the higher the wattage, the more powerful the heating element. This, in turn, means that the oil initially heats up more quickly but will also return the oil to your desired cooking temperature more rapidly once the food is added. For the most part, this yields a better cook. It gets the food frying more quickly; giving a crispier outside and keeping the inside moist, but without absorbing a lot of oil. While other factors can come into play here, such as what foods you find yourself cooking – food that takes longer to cook are naturally a little more prone to oil absorption – it’s a decent thing to bear in mind. Ah, non-stick. Often considered to be the mark of good cookware, this is no different when it comes to deep fryers. Deep fryers can truly be a pain to clean sometimes, and their materials can contribute to this. Fry baskets themselves will be metal, but the interior that holds the oil will sometimes be non-stick. If they are, then it’s an easy cleaning job for you. Also keep an eye out for the fryers that come with dishwasher-safe components, as well as fryer baskets that are stainless-steel and therefore resistant to rust and corrosion. Especially if you’re working in a kitchen with limited space, fryers can be a little tricky to find room for. There are some great compact options out there, that pack away neatly for those minimalist counter-tops. In general, the smaller a fryer’s oil capacity, the smaller the unit, but some appliances use their size very efficiently and make the most of a small size with a larger volume for oil than you’d expect. Another feature to keep an eye out for is detachable cables which can be helpful with this. No fryer is designed unsafe, but when you’re dealing with hot oil, it’s better to be safe than splattered. Detachable power cables contribute to the overall safety of a fryer in case of knocks, thereby hopefully preventing spills. 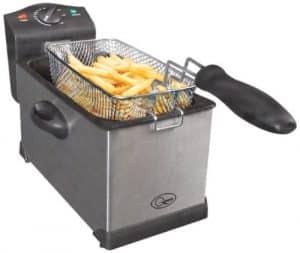 Some fryers are also equipped with automatic overheating protection and timers, to keep food (and oil) from burning, and of course, lids are essential for a physical barrier. A great many are also supplied with cool-touch handles and/or exteriors, giving you greater ease of handling. There are, without a doubt, quite a lot of variables when it comes to a seemingly straightforward appliance. Taking the information from our reviews should have all your bases covered when you’re shopping around. 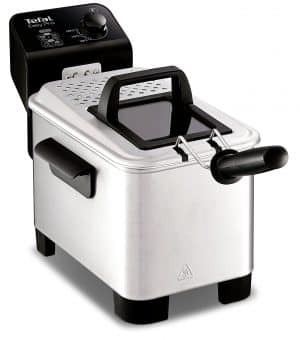 Ultimately, finding the right fryer for you should be even easier than dropping some chips in a pot of oil.